The RESI PD400 is a tool that digitally records and presents wood quality by measuring the drill’s needle resistance while it passes through a wood pile. The drill works based on the principal of measuring the drilling resistance in wood that is encountered by the drilling needle. The drill b it (needle) is inserted by the drill tool into the wood being tested under a constant drive, with the energy expended measured depending on the depth of the bit. A measurement profile generated through this process provides information about the internal condition of the wood being evaluated. This includes annual growth rings and areas of decay that are present. The drill is capable of obtaining measurements to depths up to 1,000 mm (~40 inches). The data is recorded electronically in the drill’s memory, plotted on the screen on top of the drill itself, and capable of being downloaded for analysis through software provided with the drill kit. 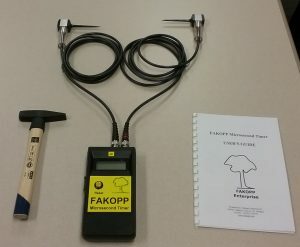 The Fakopp microsecond timer is another tool that can be used to locate and define areas of decay in wood and is especially useful for thick or gluelam timbers. Stress waves generally travel faster through sound/quality wood faster than decayed wood. If a defect or decay is encountered in the wood, the stress wave will avoid it. By measuring wave transmission time through the wood in the transverse direction, the internal condition of the element can be evaluated. The microsecond timer uses two transducers to define a line through the wood. A stress wave, created by tapping one of the sensors with a hammer, travels through the wood to the opposite sensor, with the time for the wave to reach that transducer measured. The elapsed time is displayed on the handheld timer that is connected to the transducers, and this value, which is converted to a transmission time on a per length basis, is used to predict physical conditions inside the wood. The elapsed time (in microseconds, μs) can then be compared to stress wave times for different levels of deterioration for that particular wood species. 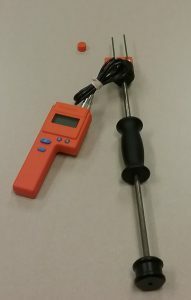 The Delmhorst J-2000 pin style moisture meter is a tool that can be used for moisture content inspection. Lower moisture content (below 20 percent) will not produce wood decay, but as moisture content begins to rise, the potential for decay increases. The Delmhorst J-2000 moisture meter detects electrical resistance between two pins (approximately 3 inches in length) driven into the wood. Based on the species of wood specified by the user, the meter converts the resistivity reading into a moisture content percentage. To request use of the wood piling test set, please complete the request form below. Anticipated length of loan (i.e. 2 weeks, 1 month, etc.)? Have you used this equipment before?